The weeks leading up to Miss Bacon Strip, Seattle's weirdest drag pageant, were more controversial than a vegan spitroast. It all started when Michael James Strangeways—the editorial director of the LGBT website Seattle Gay Scene, which sponsors Miss Bacon Strip—suggested a contestant's partner was "jealous" and "bitter" after that partner criticized Seattle venues for failing to book a large percentage of local queens for this year's Pride lineups. This led to heated online criticism against Strangeways (I joined the fray, too), as well as the contestant (Old Witch) suggesting she would not participate in Miss Bacon Strip unless Strangeways was removed from the judging panel. Strangeways and Seattle Gay Scene were removed from the competition, Old Witch agreed to compete, and the show went on. But it was what happened the morning after this year's crowning of Miss Bacon Strip that was the most sensational. After the drag artist Miss Texas 1988 was crowned this year's title holder, one of the show's producers, Sylvia O'Stayformore, announced that they "rechecked totals to see why Old Witch had not placed... and the accountants were wrong. With a 2 point difference, Old Witch is the winner of Miss Bacon Strip." 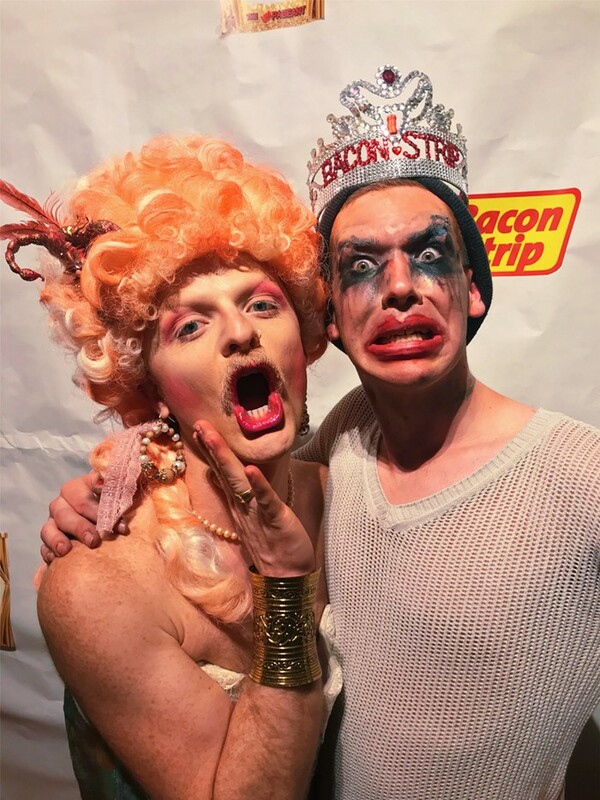 Backing up: The Miss Bacon Strip Pageant was created by Sylvia O'Stayformore in 2011 as an "un-pageant" opportunity for Seattle drag artists who didn't feel they had a place in traditional pageants or venues. "It was an originator of outsider weirdo drag in Seattle," Old Witch told The Stranger. "It wasn't just another show." Miss Texas 1988's brand of failure has fans. 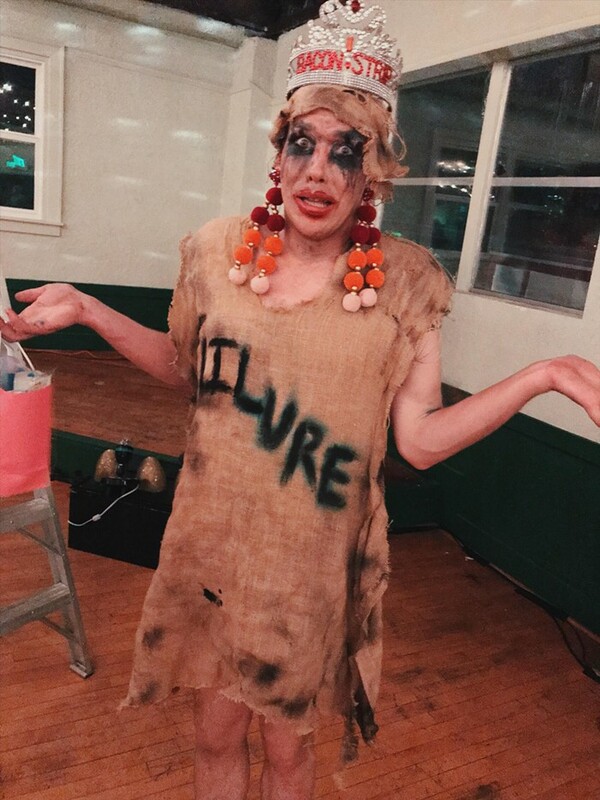 The Stranger's print editor Christopher Frizzelle called Miss Texas his "new favorite drag queen" after seeing her perform in a "crazy, bloody, gossipy, paint-splattered, deeply inappropriate show at Kremwerk." Prior to Miss Texas's Frizzelle-fame (kidding), she first went viral with this Betsy DeVos number. She's a special clown. But while Miss Texas was a fan favorite, it seemed clear that Old Witch was going to win this year's title. "I was shocked," Bacon Strip judge/last year's winner Strawberry Shartcake told The Stranger, "but so happy for Miss Texas. I assumed Old Witch had won because of her creativeness and craftiness and cleverness. She's so sharp. But it's masked in the muddiness of her style." Old Witch's performance portion involved shirtless beefcakes with inflatable props, umbrellas with secret rose pedals, and glory holes with her name on it. "Old Witch had all the points," said Shartcake. "So I was a little shocked when she didn't even place." "I can't lie. I felt disappointed," Old Witch said over the phone on Sunday. "So many people were so supportive to a degree that made me cry beforehand. I felt I like I was doing my best, and then when I didn't even place I thought I really fucked up somewhere." When she didn't win, Old Witch said past Miss Bacon Strip winners reached out to her to offer condolences. "Helen Tragedy reminded me of the time she lost her tooth at Fierce Queen. That was such an amazing number—she broke her tooth!—and Helen thought she was gonna win and she came in third. Sometimes you never know." But after Old Witch packed up on Saturday and went home to go to bed, she started receiving texts and calls from Sylvia O'Stayformore. "I thought the frantic calls and texts were like 'chin up, kiddo' texts... not THIS." At first, she didn't want to take the crown. "I didn't want someone to feel as disappointed as I felt. It took me a while to process what to do. I was just so proud of not only Miss Texas, but of all the girls who performed." But she eventually agreed: "Yes, I'm Miss Bacon Strip." Miss Texas 1988 wasn't upset by the mistake. "I really succeeded at what I wanted to do," she said. "I lost at winning, which is even better than losing." Miss Texas made a video on Sunday that clarified the mistaken crowning, but she said the word still hasn't spread to everyone who attended the pageant. "People keep sending me congratulations. We either have an awkward conversation or two minutes later they send, 'Oops. Never mind.'" What's next for Miss Texas? Nico Swenson, the artist behind the character, says they're going to hold a eulogy for Miss Texas on June 28th (their birthday), "during which I'm going to bury my head in a hole in a park and invite people to dump BBQ sauce shots on my back." As the winner of Miss Bacon Strip, Old Witch will produce the next year's worth of Bacon Strip shows with producers Sylvia O'Stayformore and Honey Bucket. In a statement announcing her acceptance of the crown, Old Witch wrote: "I believe so strongly in queer art, local queens, and the soul of this city. Let's make it one hell of a year." *Full disclosure: I'm in a drag haus with Miss Texas 1988 and Strawberry Shartcake.